Just a few years ago, not many people were familiar with the term “sharing economy.” Fast forward to today and the sharing economy is in the news regularly as it is implemented into more and more industries. Starting with travel companies like Airbnb, making its way into the transportation industry with Zipcar, and now it has made its way into the recreation industries — more specifically, the world of boating. Not only are boat-sharing clubs making it more feasible for people of all walks of life to get out on the water, but they are also flipping the way we go about boat rentals upside down. In previous times, boating was considered to be a “rich man’s sport,” reserved only for those with the financial freedom to invest thousand, if not, hundreds of thousands of dollars into a recreational hobby. 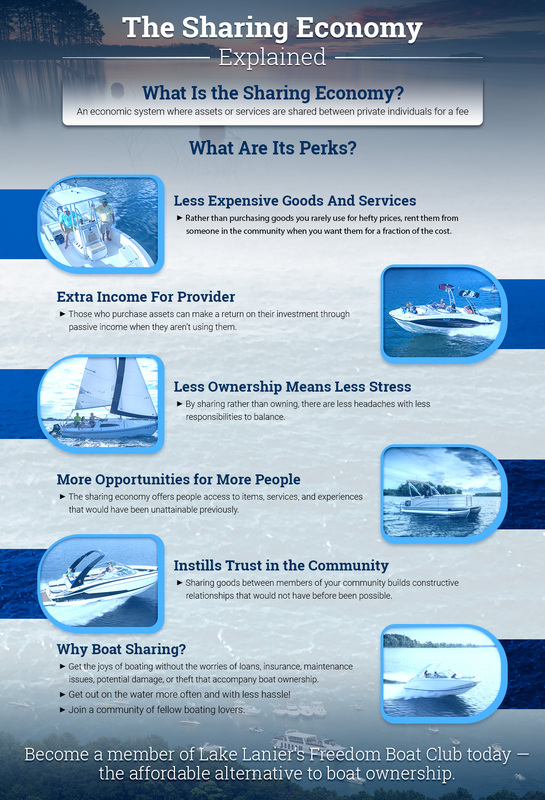 Thanks to boat sharing companies like Freedom Boat Club, though, everyone has the opportunity to enjoy the perks of boating without the financial burden or responsibilities of boat ownership. 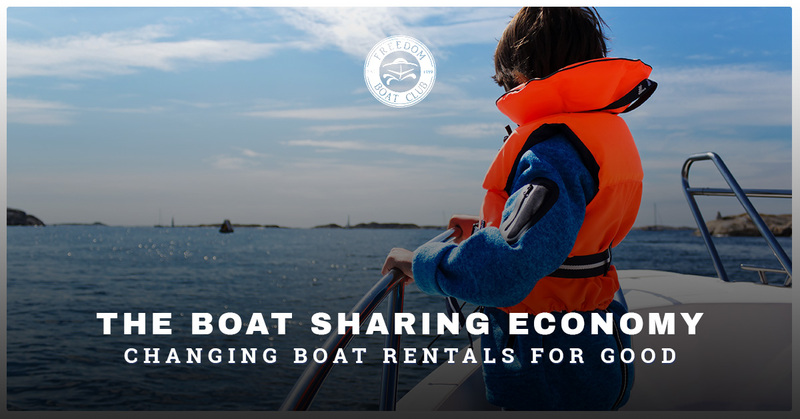 In order to help those unfamiliar with boat sharing get a better grasp, in this week’s blog, we are going to dive into what the sharing economy consists of and how it is changing the way we go about life as consumers in countless ways. In the traditional capitalist economic model that America has consisted of for the considerable past, people owned everything. If you wanted to get be able to get across town, you had to buy a car. If you wanted to stay in a house on the beach, you had to buy a beach house, and if you wanted to go for a ride on a boat, you had to buy one — or make friends with someone who has. In a sharing economy, goods are owned by just a select group of people, but other people may pay to ‘borrow’ them when they aren’t in use by the owners. For instance, when you aren’t out using your car, you can have it make money for you by allowing others to borrow it to get around town. Back in 2009, thanks to companies like the apartment-sharing website Airbnb, complete strangers became capable of borrowing each other’s desirable goods or services in return for money. Today, the sharing economy goes far beyond homes, cars, and other traditional assets to include office space, bikes, dog sitters, and even boats! Why has this new approach to business and consumerism taken off in such a remarkable fashion? Let’s discuss the advantage it has to offer when compared to traditional purchasing of goods and services. The sharing economy is entirely built upon the concept that sharing certain goods and services is more efficient than everyone purchasing their own. This can lead to the costs of obtaining these goods and services. How so? Let’s do some basic economics. If supply increases for any good while demand remains intact, prices inevitably drop. When you plug in a sharing economy, suddenly one good can be multiplied into many as it is available for countless other people to use. This, in turn, means that “supply” is increased without any more products actually being produced. This is what makes it more affordable and justifiable for people to obtain more goods. For instance, say you need a 40-foot ladder at your house one time a year for hanging up Christmas decorations. Rather than paying hundreds of dollars on something that will spend 99 percent of the time collecting dust in your garage, you can simply rent one off someone close by for the day for only $20. The same concept applies to services, such as an annual house cleaning or a ride to the airport. On the other side of the spectrum, those who do opt to purchase goods can also have a means of making a return off their investment, no matter what it may be. From a vehicle that’s sitting in the driveway unused to a 40-foot ladder that your neighbor needs for his Christmas lights, there are countless ways to bring in passive income off the assets you own thanks to the sharing economy. You can even earn extra income while you’re doing other things, like going for a boating day on the lake. Not too long ago, what you owned was seen as a symbol of socioeconomic status. This all seemed to change once the economic depression of 2008 came around. Assets have quickly turned into a liability in many cases, making owning things, especially expensive things, more daunting. Thanks to the sharing economy, people can live a leaner existence that requires holding onto fewer valuable possessions, leading to less worries. Owning a boat is a great example of this — if you don’t live right on the water and aren’t made of money, it’s likely that boat ownership will leave you with more headaches than it does excitement. Being able to enjoy boating without having to deal with loans, insurance, maintenance issues, and potential damage or theft is a great option for many boating enthusiasts, which is why so many people are opting to become Freedom Boat Club members. The sharing economy offers people access to items, services, and experiences that would have been unattainable previously or impractical to purchase for themselves. One of the greatest feats of the sharing economy has been the ability for anyone to receive loans or investments for their entrepreneurial pursuits, no matter what their standing might be with their bank, thanks to crowdfunding companies like Kickstarter and many others. This makes it possible for people to do things with their lives they never before imagined, from starting a business to spending their summer boating! Before the sharing economy was introduced, the idea of allowing a complete stranger to use one of your prized possessions was something that was unheard of. Now that technology has been implemented with built-in ratings and reviews for sharing platforms, consumers remain honest in order to reap the benefits of accessing items in the sharing economy and providers have more peace of mind in allowing others to have access to the items they own. These trust-building efforts are helping those who participate in the sharing economy build constructive relationships with one another, where none existed previously. There are currently over 22 million recreational boats owned by Americans, and each of these boats are used on average only 11 days each year. That’s over $3.6 billion spent by consumers for items used for a small fraction of their lives. The fact is, boats are expensive, and they are also a lot of responsibility to maintain, which is one of the reasons that the average amount a boat owner takes out their boat is only around four weekends a year. On top of this, people are busier today than ever before, so even if they want to spend a day out cruising on the lake, they rarely find the time to put forth all of the preparation that is required. This where boat clubs and boat sharing companies like ours come to the rescue. Now whenever you’re itching to get out on Lake Lanier for a day of boating fun, all you have to do is show up, hop in, and get to it! If you want to learn more information about our boat rental and membership program, see our frequently asked questions. What Sets Our Boat Club Apart? Freedom Boat Club was among the first to pioneer this revolutionary idea that would change the way we go about boat rentals for the foreseeable future. The concept has proven to be highly successful in getting more people renting boats, as there are currently over 15,000 boat club members enjoying boating in 22 states and even Canada. What makes our boat rentals program different than other boat rental companies or other businesses within the sharing economy is that you pay for a membership, which in turn gives you access to a wide variety of rental boats to choose from — from cruisers to pontoons and even speedboats. This means that instead of having to go about the process time and time again of purchasing a rental as you would with an Airbnb booking or other asset-sharing companies, you pay an annual membership cost which gives you the ability to select and reserve your boat of choosing from our fleet at any time. By providing a membership rather than individual boat rentals with our boat sharing program, we are also able to offer an entire experience with our boat rentals. At Freedom Boat Club of Lake Lanier in Georgia and every other location across the country, you are joining a social club that gives you access to a community of boaters to enjoy the boat sharing lifestyle along with. We often host events for our boat club members at Lake Lanier, giving everyone a chance to meet their fellow Freedom Boat Club members and make new friends who share the same love for boating. The last area that differentiates our boat sharing concept from other members of the sharing economy is that we include comprehensive training! This way, you can quickly become an avid boater even if you have never once stepped foot on a boat in your life! This not only gives more people the opportunity to experience and enjoy the boating lifestyle, but it also ensures the safety of everyone aboard our boat rentals and that our fleet lasts for many more club members to come. Outside of our training, we also offer a variety of boating tips and tricks in our blog! Now that you have extensive knowledge about the sharing economy, how revolutionary it has been to how we go about our lives as consumers, and how Freedom Boat Club has even taken it to the next level, we hope that you will join in on the fun! If you’re interested in becoming a Freedom Boat Club member in Buford, Georgia on the beautiful Lake Lanier, inquire today!